Anti-bedbug covers for mattresses and pillows with certified and patented protective closures and zips. Protects mattresses and pillows from bedbugs, bacteria and dust mites by blocking them from entering and exiting and thereby preventing their bites. Prevents bedbugs from spreading from the bed, their favoured habitat, to other places such as bedroom furniture, carpets, suitcases, and so on. Helps detect and eradicate bedbugs. Provides a safe and hygienic place to sleep in that is free from bedbugs, bacteria and dust mites. Our BUG SECURE® closure, our fabrics and our seams are certified by specialised laboratories. It is silent and bi-elastic, and maintains the original comfort of your mattress. Easy-care: machine washable and tumble dryable. 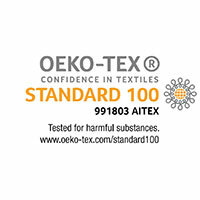 Oeko-Tex Standard 100 Class I Certified. To have the maximum comfort at home. Comfort should be a priority. High quality at all times.